This post is sponsored in partnership with NOW Foods. Thank you for supporting the brands I trust and having the pleasure of working with, helping make Fit Mitten Kitchen possible! Guys… Spring is two weeks away. TWO WEEKS. 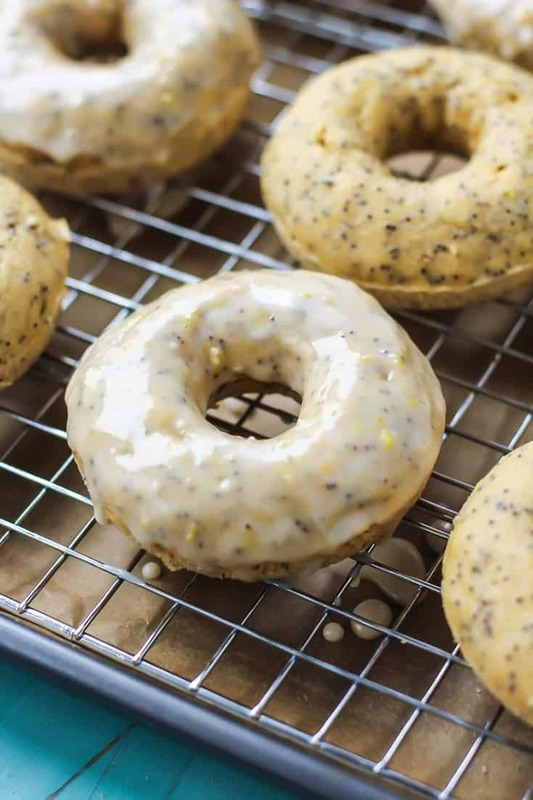 And even though I can’t really count on Michigan weather to be “spring-like” anytime soon, I CAN pretend warmer weather is coming with some lemon poppy seed things… and by things I obviously mean DONUTS. I don’t know why but I always feel like I have to explain myself when making “healthier” alternatives. Either way though, my work friends didn’t seem to mind 🙂 I mean, can you really go wrong with the word “donut”? Baked, fried, glazed, powdered… they’re all pretty great. 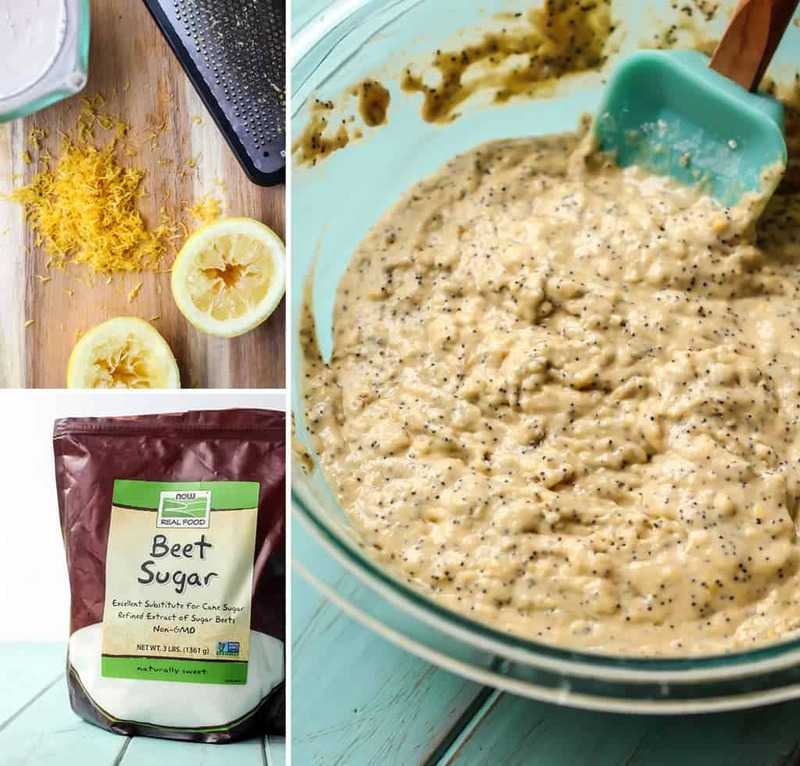 We’re using granulated beet sugar from my friends over at NOW Foods. It is a great sugar substitute to bake with, especially if you have an intolerance to cane sugar. That is not to say I think it is “healthier”. Sugar is sugar. Just trying to share options! NOW Foods actually has TONS of products I use every day. Their cooking oils (also used in this recipe) are great quality and reasonably priced. And their vanilla extract is organic and non-gmo. NOW is committed to making sure ALL of their food line brands are non-GMO. I truly value partnering with brands that are committed to not only making sure they’re producing quality products, but also practice being transparent. You’ll notice from the above pictures you will fill the donut pan *almost* full. Make sure to grease/oil the pan fairly well to ensure the donuts come out in one piece. Then gently remove them and allow the donuts to cool on a wire rack. Then it’s on to THE GLAZE. You kind of can’t do donuts without a glaze, right? This glaze is really simple: powdered sugar, lemon juice and lemon zest. And if you don’t have powdered sugar at home, you can actually just process the beet sugar with tapioca starch or corn starch until it reaches a super fine texture. It will mix up just like store-bought powdered sugar! Then we dip the donuts… and eat. Preheat oven to 350F. Grease donut pan cavities with oil, set aside. In medium bowl add milk with freshly squeezed lemon juice. Stir and let sit for 2 minutes. In a large mixing bowl combine whole wheat pastry flour, poppy seeds, baking powder, baking soda, salt and lemon zest. Set aside. In the medium bowl with milk + lemon juice mixture, add in oil, beet sugar, egg and vanilla extract. Whisk together until combined, then gently add to large bowl of dry ingredients. Use large spatula to mix until just combined. Gently spoon batter into greased donut cavities until 3/4 full (see pictures in post), about 3 tablespoons of batter. Bake for 8-10 minutes (see pictures in post) then allow to cool in pan for 3-5 minutes before transferring to wire rack to cool completely. Repeat with remaining batter, you should have about 12 donuts. While donuts are cooling, make your glaze: combine 3/4 cup powdered sugar with 2 TBS freshly squeezed lemon juice, more zest if you wish. Gently dip donuts into bowl of glaze and place back on cooling rack–place parchment paper or pan underneath to catch drippings. Allow glaze to set, about 5 minutes, and enjoy your donuts! *Can sub regular dairy (cow) milk as well. **Can sub a gluten-free all purpose flour. Donuts are best enjoyed fresh but will last in container at room temperature up to 3 days. I would really love to make this recipe!!! Any recommendations on how to sub the whole wheat with Oat or Almond flour? I do not incorporate whole wheat or white flour into my lifestyle. Thank you!!! I’ve totally discovered with my blogging friends that healthier alternatives do not have to lack in taste at all; in fact they can have more taste and texture than if you just added a ton of sugar. 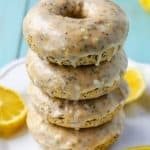 I’m ALL for sugar, but I like it in moderation, and I love other flavors to come out too like the LEMON and poppyseeds. 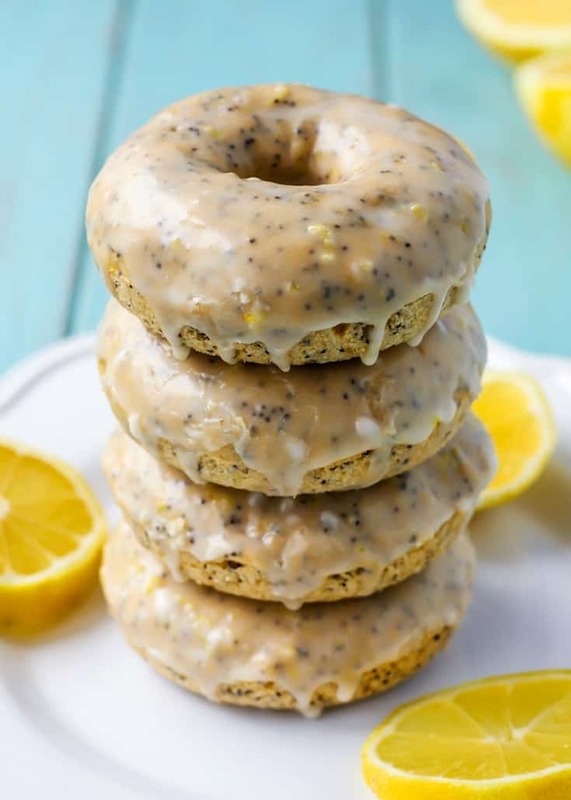 Lemon poppyseed bread has to be one of my favorites, and I love that you turned it into donuts. Pinning for later! 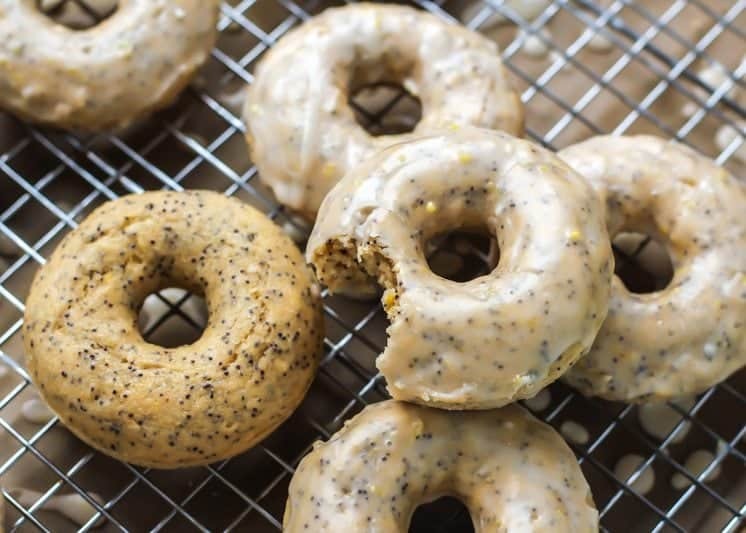 Yes, lemon poppy seed is just too good to pass up! Thanks so much for pinning Emily! These look amazing! just listening to your podcast with Georgie, so good 🙂 your advice is awesome, and perfect timing for me right now going through yet another blog slump! I want to make these next weekend but I’m pretty much a learned-from-mom, all-purpose-flour-user for baking. I do have a bag of wheat flour but the container just says whole wheat flour, not “whole wheat white”. So I’m going to ask the most basic of questions. Is this the same thing??? Hi!! Is it possible to use coconut sugar instead of beet? Do you think I could substitute the eggs with bananas or apple sauce (probably more likely apple sauce…. not too many bananas get ripened enough for this around my house… we love our bananas! Lol)? 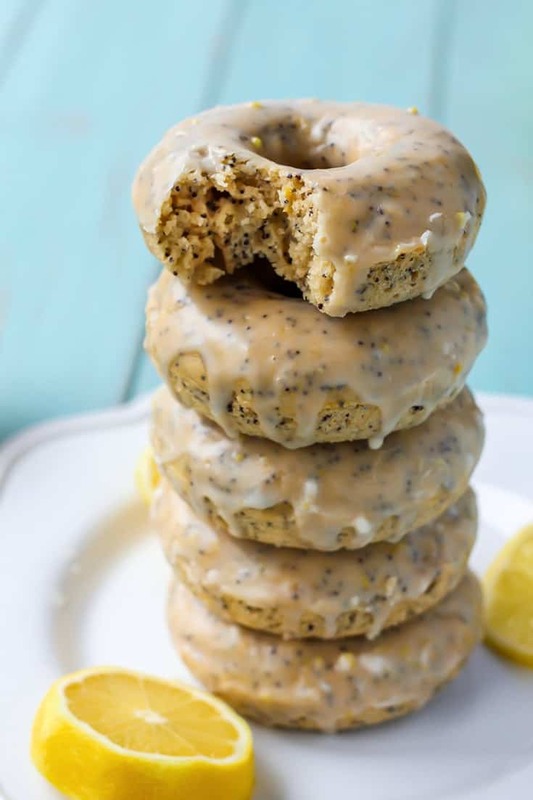 I have a dairy and egg allergy and these donuts look amazing!! Hi Stef! I would actually sub the egg for a flaxseed “egg” if possible. So 1 egg substitute is 1 TBS flaxseed meal + 3 TBS water – let sit for 5 minutes to get up. That will act as a better sub than applesauce here, in my opinion. Hope that helps!